Call upon the gods of Olympus to help you rescue your beloved before all hope is gone! Wield the power of the sun, the wind, the rain, and more as you face towering obstacles, encounter strange enemies, and repair a ravaged land! 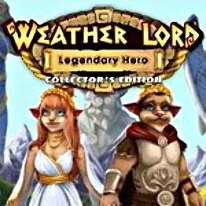 Unfolding with the scope of an epic fantasy adventure, Weather Lord: Legendary Hero – Collector's Edition will capture your imagination as it draws you into hours of compelling gameplay! - Tons of AWESOME extras!